Coll. No. 246, 5 June 2000, characters observed: Perennial (assumed), to 40 cm. 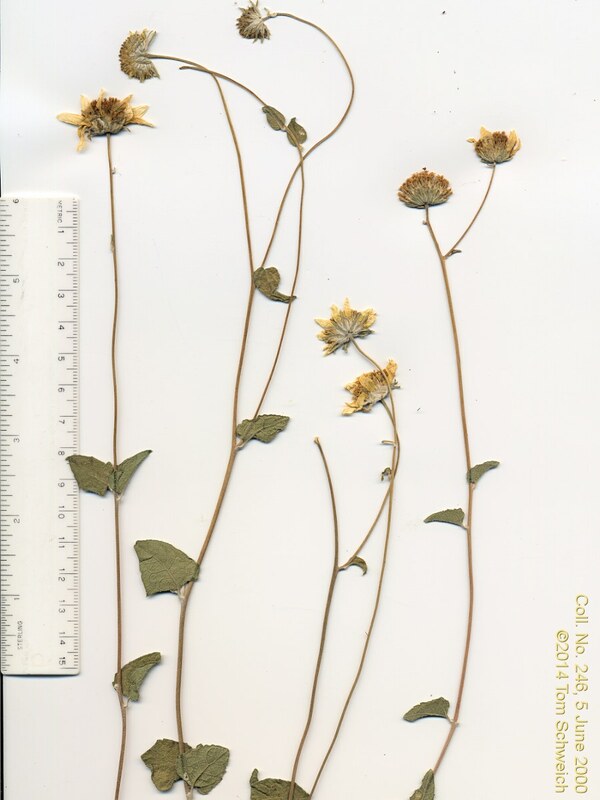 ; Leaves, basal unknown, cauline present; Phyllaries, in 2 series, ±equal, abruptly narrowed at middle, not subtending ray flowers; Receptacle, flat, paleate, palea folded around disk flower ovary; Flowers, of two kinds, heads radiate; Rays, yellow, sterile, style 0, pappus of short scales; Disk, pappus of short scales and 2 long scales; Fruit, compressed, hairy, but margin not ciliate. Field Notes: Coll. No. 246. Other photos about Species - Asteraceae or Bahiopsis parishii.